Mango is highly nutritious and also good for healthy hair growth. Mango seed oil is one of the oils that are good for shedding and hair loss; it also helps delay grey hair. ■ Remove the pulp and let the kernel dry. The kernel is also used for moisturizers and you can remove it to take the seed out. You can use pliers to remove the seed but be careful not to cut yourself. ■ Place the seed in a jar filled with coconut oil. Keep this jar in sunlight and after a few days, your mixture is ready. Apply this mixture just like you oil your hair and rinse your hair using either a mango conditioner or a ‘wash out’ conditioner. The recipe is very simple to prepare and you don’t even have to spend a lot of money. Anything handmade has its own unique value and with the added benefits, you are surely going to love it. Try this at home and let me know if you liked it. Many ladies suffer from hair problems and while some of us struggle with frizzy, dry hair, others struggle because of hair fall problems. However, you don’t have to worry anymore as the king of fruits can really help you. Whether your hair is oily, dry or frizzy, a rich mango conditioner will help reduce most of your problems. If you read the labels of the products you buy, you will notice that mango oil is used in most of them. For those who have the time you can make your own. 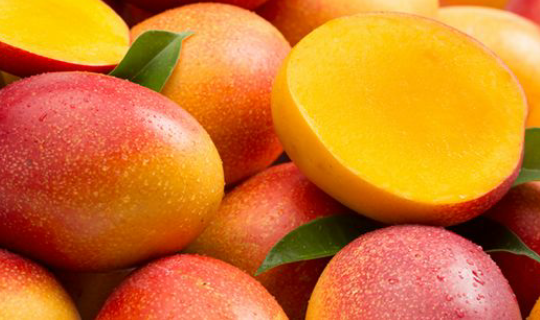 Mango oil is used to treat dandruff and dry hair. It contains Vitamin A and helps reduce Dandruff while adding luster to your hair, thus making it shine. Mangoes contain Vitamin E which helps hair growth and increases blood circulation, thus making your hair long and shiny. ■ Wash the mangoes and peel them. Remove the seed and blend chunks of mangoes using a blender. ■ Peel the banana and mix those chunks with the mango paste in the blender. ■ You can either use vitamin E capsule that’s available in capsules or bottles in many stores. Pour a few drops into the blender and mix it with the paste. ■ Pour a few drops of olive oil and mix again. ■ Mix all the ingredients and blend again, until the mixture turns smooth and soft. That’s about it and you’re done! Use this mixture by slathering it on your hair, just like you use a shampoo. Waiting for the mixture to set for about 20-25 minutes provides best results. Rinse your hair with warm water apply your Shea mix and style! You have any input? Will love to read. sure to boookmark your blog and may come back later in life. Optimization?I'm trying to get myy blog to rank for some targeted keywordss but I'm not seeing very good results. My brother recommende I might like this blog. He was entirely right. This publish actually made my day. You cann't imagine just how muich timje I had spent for this info! and wiⅼl be tweeting tһis tߋ my followers! Excellent blkg and fantastic desiɡn. Welcome on board nice having you here . I've learn several just rigbht stuff here. Definitely price bookmarking for revisiting. i am browsing this site dailly and geet nice daya from here daily. I will be sure to bookmark itt aand return to read more of your useful information. Thanks for thee post. Thanks, happy you found the website useful. This post will assist thhe internet peole for building up new web site or even a blog from start to end. He was once totally right. This publkish truly mzde my day. You cann't consider just how so much time I had spent foor this info!